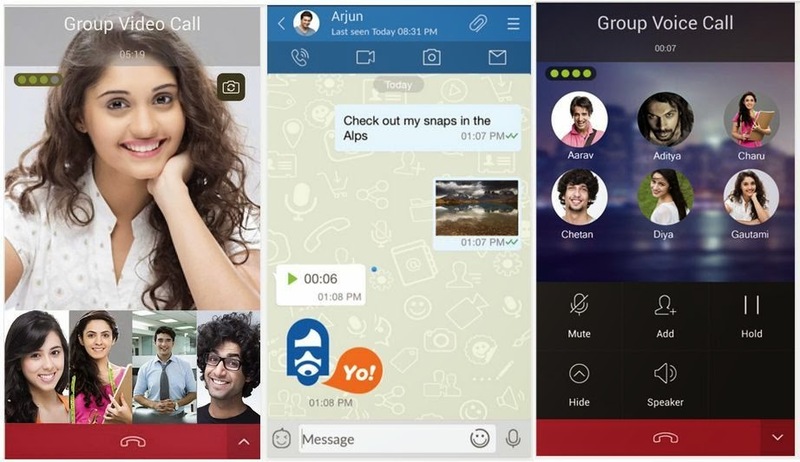 Reliance Jio Infocomm Has Launched Its First Product A New Instant Messaging Application With Voice And Video Calling Feature Called “Jio Chat”. Jio Chat Is Available For Android And IOS Devices. 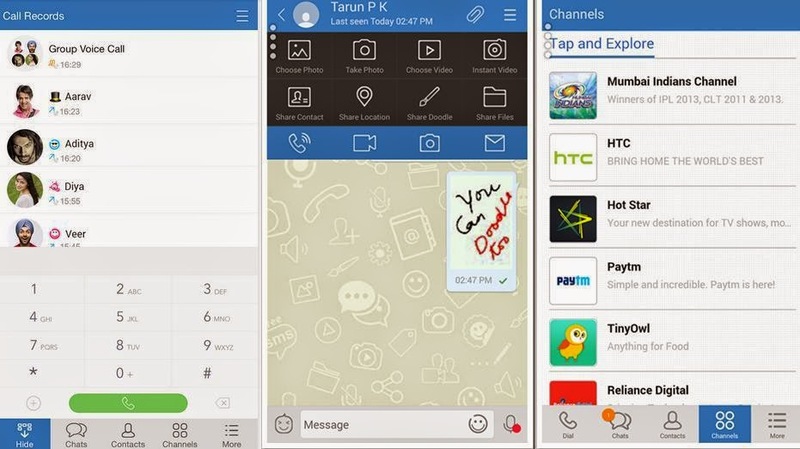 This App Will Compete With Popular Apps Such As WhatsApp, Line, WeChat And Hike In India. The Jio Chat Is Similar To Other Cross-Platform Instant Messaging Applications Like WhatsApp, BBM, Line, Hike And WeChat. Along With Voice Calling, Video Calling, Group Video Chat, Conferencing, Messaging, Instant Video, Audio Notes, Stickers, Doodles, And Emoticons, The Application Also Offers Location-Sharing And Status-Sharing. Jio Chat Works On Both Wi-Fi And Mobile Internet Connections. It Also Features Jio Chat Channels, Similar To BBM Channels, Which Lets Users Keep A Track Of The Latest Updates From Their Favourite Brands And Celebrities, Apart From News, Entertainment, And Sports. This Is Also Where Users Can Find Special Promotions. While Several Instant Messaging Apps Offer The VoIP-Based Voice Calling Facility, WhatsApp Added The Feature Only Last Month And India-Based Hike Recently Also Rolled Out The Voice Calling Feature. So I Think The Jio Chat App Has Everything You Would Expect From A Mobile Messenger App Along With Number Of Extra Bells And Whistles. Let Us Look At Each Of The Features. 1. 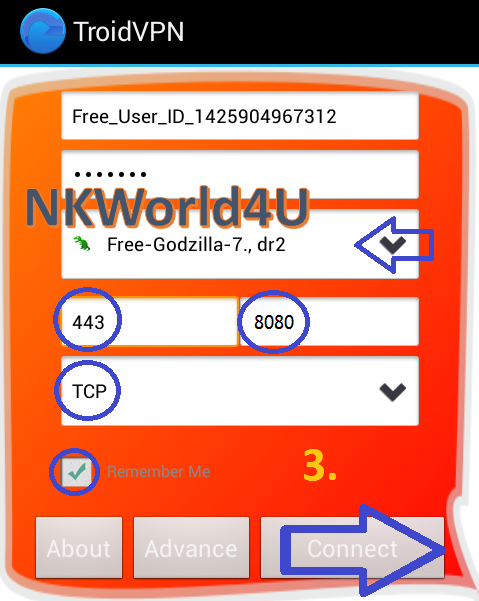 Enjoy Instant Messaging, Free SMS, Voice And Video Calling And Much More In A Single Application. 2. Chat One-To-One or In Groups with Emoticons, Stickers, Pictures and Video Share For A Media Rich Experience. 3. One Tap Conference - Pick Your Friends And Start A Conference With Just One Click. 4. Updates & Offers - Get The Latest Updates And Offers From Your Favourite Brands. 5. Video Calling and Video Chat. Voice Conferencing. 6. Users To Send Free SMS Invites To Offline Friends. 7. Send/Share Anything & Everything Like... Zip, Pdf, Doc, PPT Document Files, APK App and Much More. Send Any Attachment Up To 100 MB Each File. Instantly Connect With Friends, Family, And Brands Using Jio Chat. Connect For Free Across Any Mobile Data Connection Or Wi-Fi, No Matter Where In The World You Are. Connect With Your Favourite Brands And Celebrities Using Jio Chat Channels. Keep Up On The Latest News, Entertainment, And Sports. Welcome Friends, Previously I Was Shared On This Blog A Free Recharge Offer - Download Gaana App & Sign Up Via Your Facebook A/C And Get Upto Rs. 100 Free Mobile Recharge. I Hope You Like This Offer. 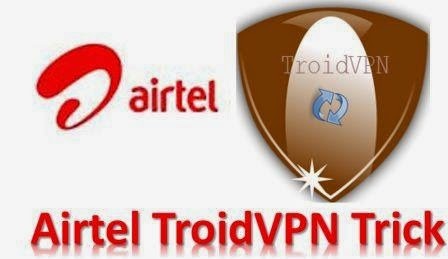 So Today We Are Posting A New Free Recharge Offer, In This Offer You Can Get Rs. 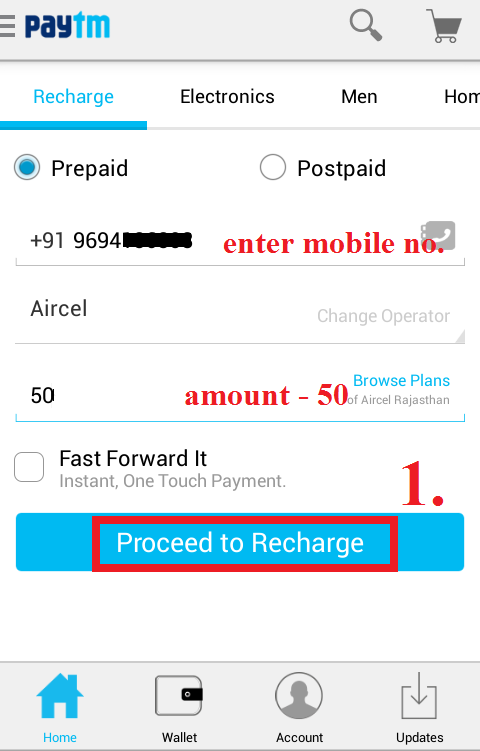 50 Mobile Recharge Absolutely Free Just By Download Single App. This Free Mobile Recharge Offer Is Offering By The Times Of India News App. You Need To Just Download The Times Of India News App And Sign In Using Your Facebook Id/Account To Get Free Rs. 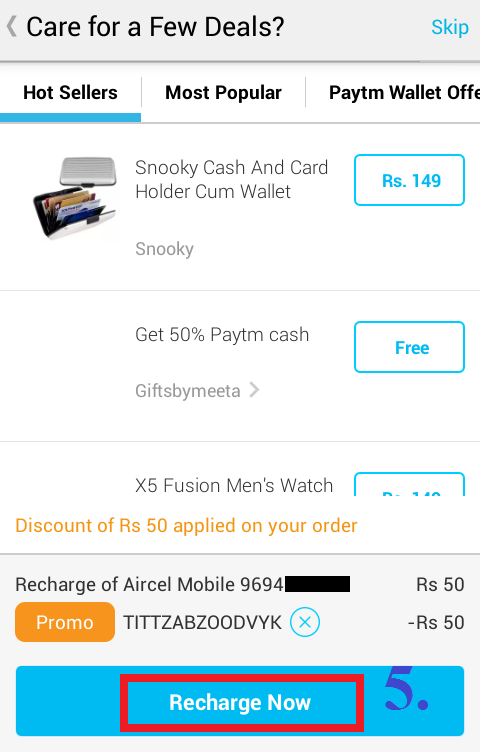 50 Paytm Mobile Recharge Voucher. 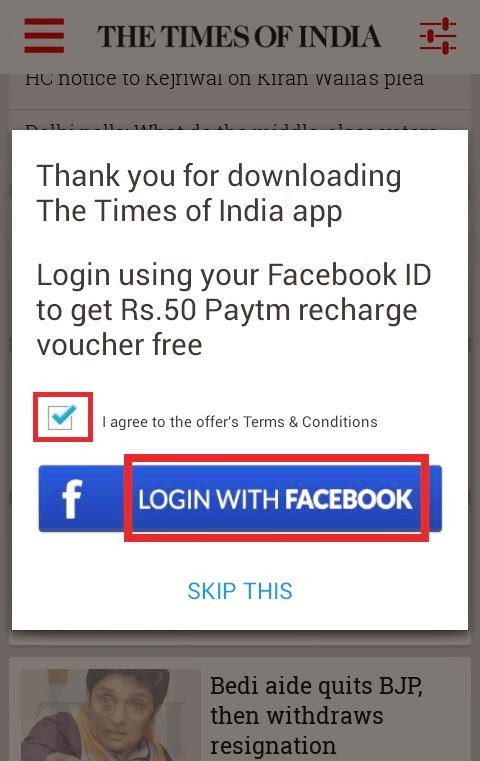 The User Must Have Minimum 90 Days Old Facebook Account & At Least 10 Friends In His/hers Friend’s List Prior To Date Of Downloading The Times Of India App & Registration Under This Offer. Times Of India Is Promoting There Mobile Apps By Giving Free Rs. 50 Recharge For Everyone Who Download And Login/Sign Up Via Facebook Account To There App. 1. This Offer Is Only Applicable For The Android And IOS Mobile Users. 2. 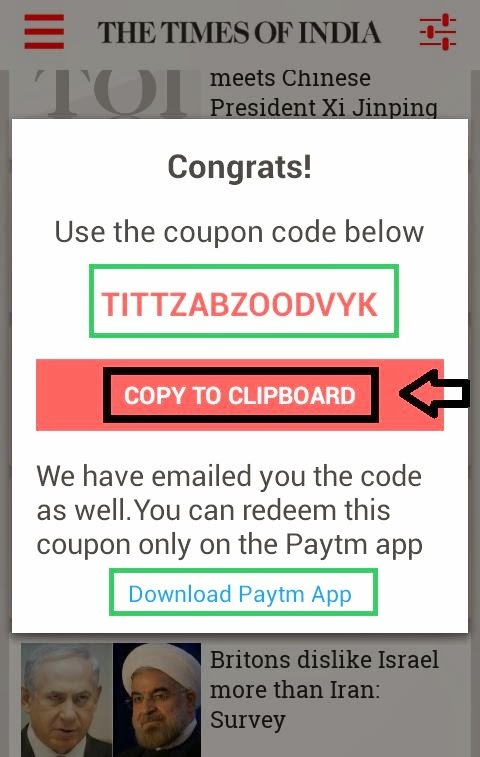 You Can Redeem This Coupon Code Only On The Paytm App. 3. 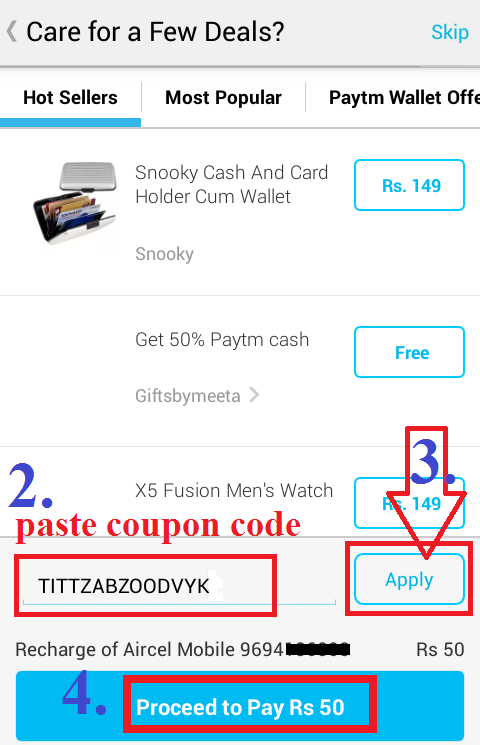 Redeem On Paytm App (Voucher Can Be Redeemed Only On Same Registered Paytm Account). 4. This Offer Is Also Applicable For Post-Paid Mobile Customers. 5. Rs. 50 Recharge Coupon Can Be Used/Redeemed Only By One User/Email/Mobile Number. 6. You Can Use Only One Account to One Android Phone. 1. First Of All Download The Times Of India News [TOI] Mobile App. Note: Please Update to Latest Version. 2. After Download - Just Install Times Of India App – Open Times Of India (TOI) Mobile App. 3. Check Mark on ‘I Agree To the Offer's Terms & Conditions’. 4. Then Click On "LOGIN WITH FACEBOOK". 5. After Open Facebook Screen Enter Your - Facebook User Id and Facebook Password. (See Image Below). 6. After Successful Login Wait For Few Minutes You Will Get another Popup with Recharge Voucher. 7. Now Click On ‘COPY TO CLIPBOARD’ and Copy Coupon Code. 8. Coupon Code Also Emailed On Registered Email Id OR You Can Also See Your Coupon Code In Settings >> Offers. 1. First Of All Download Paytm Mobile App. 3. Now On The Recharge TAB - Enter Your Mobile No. – Select Operator – Amount 50 & Click On >> Proceed To Recharge. 4. On Next Window - Paste Your Received or Copied Coupon Code and Click On >> "Apply"
5. Now Click On >> "Proceed To Pay Rs. 50". 6. 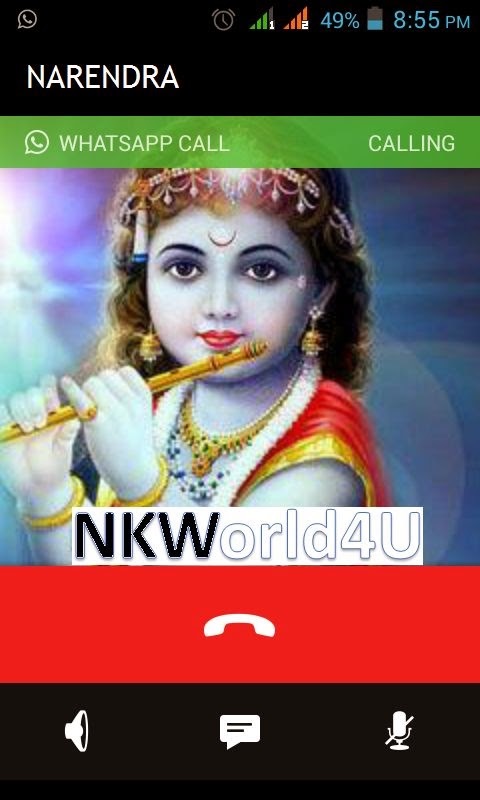 Now Click On >> "Recharge Now". 7. That's it. Enjoy Rs. 50 Recharge. 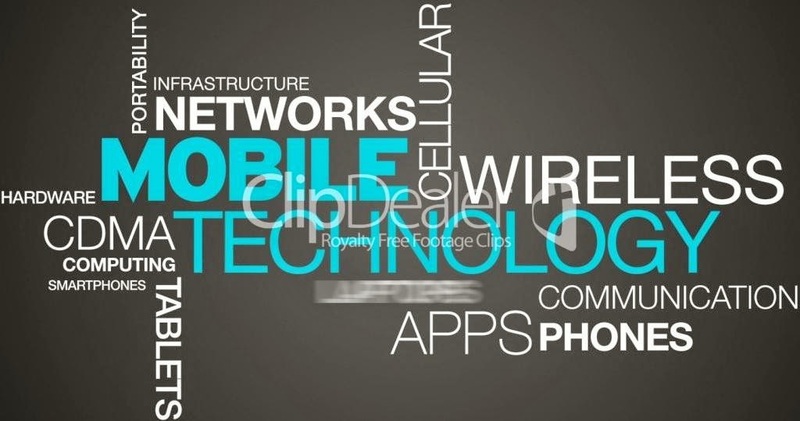 Today In This Post We Are Sharing The Definition or Meanings Of Some Gadget Technology Terms. That You Many Times Search On Internet Like "What Is This". We are Sharing This Post In Hindi. If You Want To Read In English Or Other Language Then Use Google Translate. WhatsApp Is One Of The Most Popular Messaging Apps Out There. Because Its Interface Is Very Simple, Anyone Can Easily Understand It. WhatsApp Messenger Is A Cross-Platform Mobile Messaging App Which Allows You To Exchange Messages. It Is Currently Available For Different Mobile Platforms and Desktop (WhatsApp Web Web.Whatsapp.Com). Using WhatsApp Messenger You Can Create Groups, Chatting, Send Each Other Unlimited Images, Video And Audio Media Messages. But Now A Day You Can Make Free Call to WhatsApp. Yes, WhatsApp Has Finally Released The Most Awaited Voice Calling Feature For All The Android Users. To Get It, You Will Need To Download Latest Version 2.12.7 From The WhatsApp Website. According To Many Websites The Voice Calling Feature Can Be Activated Is By Receiving A Call From Someone (Invite System) Whose Voice Calling Is Already Activated, After You Get A Call You Need To Close And Reopen The App. But Friends Here We Are Sharing A Trick Using This Trick You Can Activate/Enable WhatsApp Calling Feature Without Follow Any Inviting System. 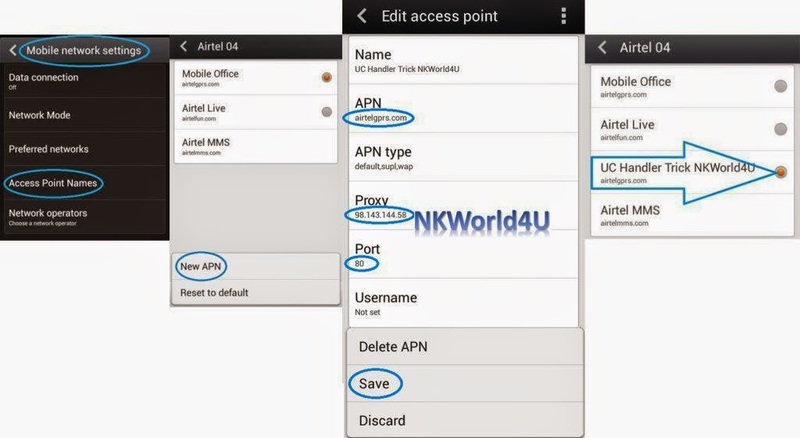 So Here We Are Sharing Two Methods For Activate/Enable WhatsApp Calling Feature. If You Use Android, And Haven't Yet Activated Voice Calling On WhatsApp, What Are You Waiting For? 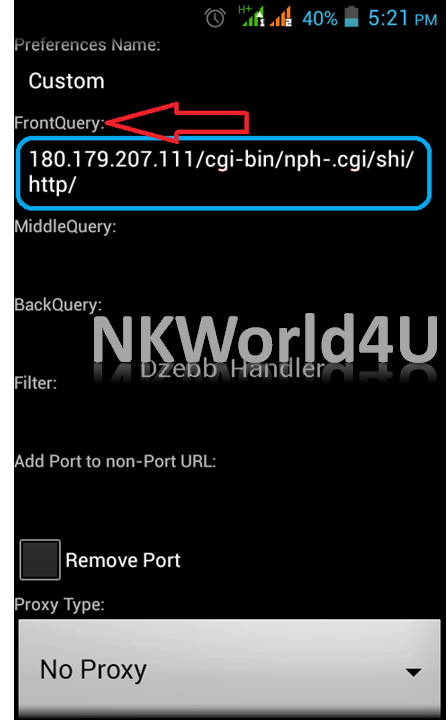 Method 1 :): - Enable WhatsApp Calling Feature To Change In Root Setting - Trick. 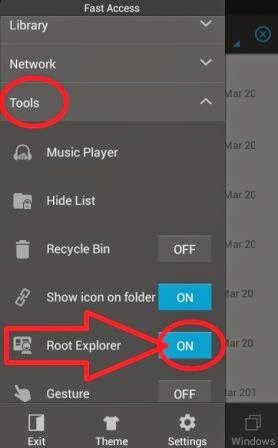 (Only For Rooted Mobile Users). This Is Not An Official Trick/Method, Try at Your Own Risk. 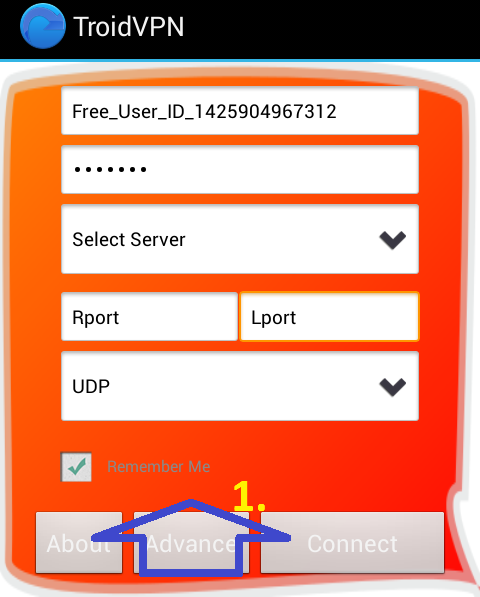 This Method Is Very Simple But You Need To Rooted Android Mobile. 1). 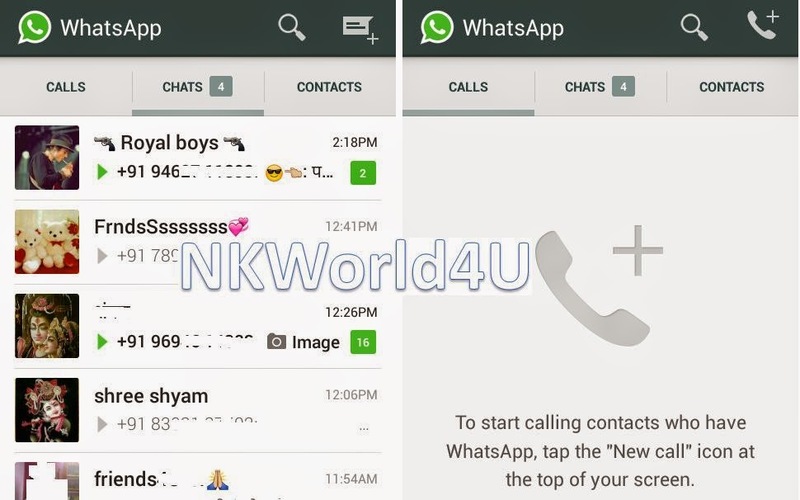 WhatsApp Android App - Latest Version 2.12.7. 2). 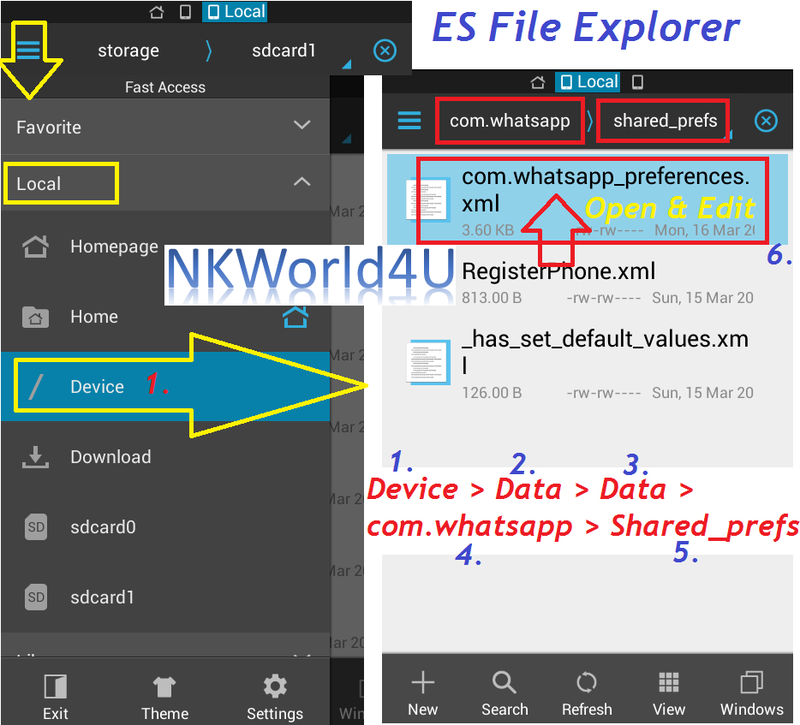 ES File Explorer Android App. Note: The Latest Version on WhatsApp’s Website Is 2.12.7, But If You're Downloading from Google Play, Ensure That Your Device Has Version 2.11.561. Older Versions Of WhatsApp Don't Support This Feature For All Android Users. 2. After Download, Install It. 4. 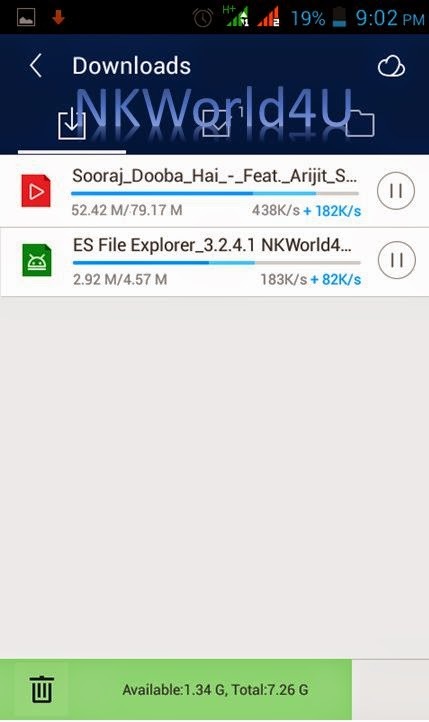 After Download, Install And Open ES File Explorer. 11. Now Edit This “Com.Whatsapp_Preferences.Xml” File. 13. That’s it. 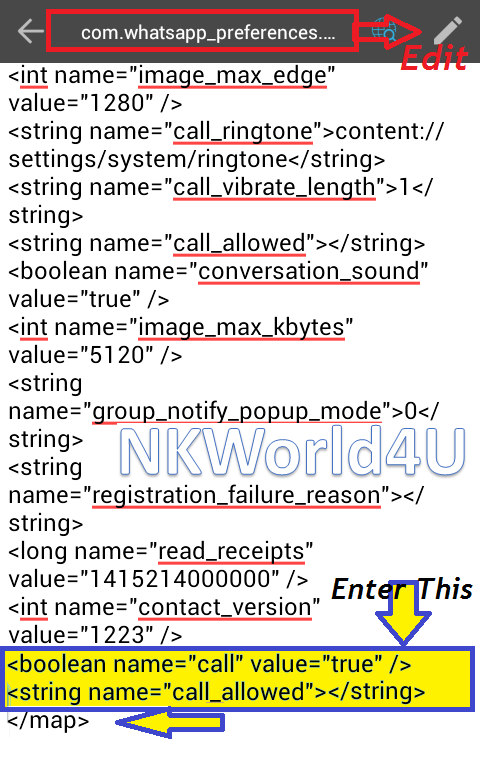 Now >> "SAVE" This “Com.Whatsapp_Preferences.Xml” File. 15. Then Check. Now You Will Find Three Tabs – Calls, Chats, Contacts. If Above Method Not Work, Try This Second Official Method. The message reads, "Hey, I am inviting you to try WhatsApp calling click here to activate now-> http://WhatsappCalling.com". Do not click on this link - as we noted earlier the only way to activate WhatsApp calling is to be running the latest version of the Android app and to receive a voice call from someone who already has the service. Quick Heal explains, "this message is a hoax and an attempt to get users to download malicious apps and fill a survey form." So stay away from such messages and enjoy WhatsApp voice calling safely - once you finally receive it. The Process Isn't As Simple As Updating WhatsApp To Start Using The Voice Calling Features. It Involves A Couple More Steps That You Need To Follow. We've Described These Below, So Take a Look to Enable Voice Calling Feature on WhatsApp for Android. 1). First Of All Download or Update and Install the Latest Version of WhatsApp Messenger for Android: Download WhatsApp 2.12.7 APK from Here. Once You Have The Latest Version Of WhatsApp Installed On Your Android Phone. 2). All You Need To Do Is To Ask Someone (WhatsApp Users) Who Has Already Enabled WhatsApp Calling Feature, To Make A WhatsApp Call On Your Number. 3). Users Have Reported That Giving A Missed Call Doesn't Work. You'll Have to Receive the Call and Wait for A Few Seconds before Disconnecting to Activate WhatsApp Voice Calling. 4). When The Feature Is Enabled On Your Smartphone, You Will See There’s A Change In WhatsApp Interface And Now You Can Find Three Tabs On The Top Right Section – Calls, Chats And Contacts.